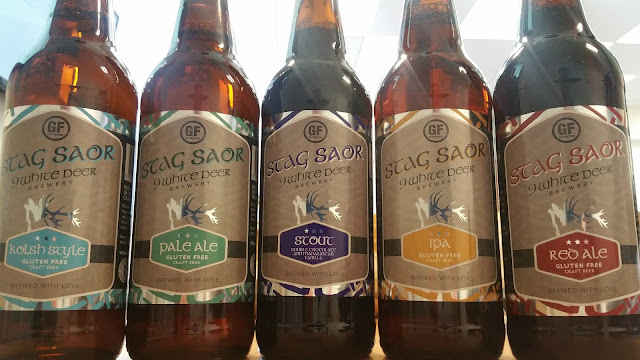 I wouldn't wish celiac disease on anyone but at least they can now enjoy a range of Irish beers which are unlikely to trigger any symptoms. 9 White Deer from Cork have released not one but entire range of 5 different beer styles which are certified as gluten free. Each batch is independently tested to be sure that the gluten levels are below 20ppm. For most people with a gluten intolerance or celiac disease, this will cause no symptoms or discomfort however as with any allergy, some people can be more sensitive so I would advise caution if you are known to be hypersensitive. Co-founder Don dropped these samples off to me the other week. Don was diagnosed with a gluten intolerance a year after the brewery opened and it's because of this that the brewing direction changed to brewing gluten free beer. I'm going to take a brief moment to talk about gluten. It's a group of proteins found in barley and wheat which are the two main cereals used in beer. It's also found in rye and oats to a lesser degree. I think oats don't technically contain gluten but cross contamination occurs and a similar protein which is also bad for celiacs is often present. Gluten free certified oats are available though. Up until recently, gluten free beer was made from other products like sorghum, buckwheat or rice as well as a number of other ingredients, pretty much anything that is carbohydrate based. 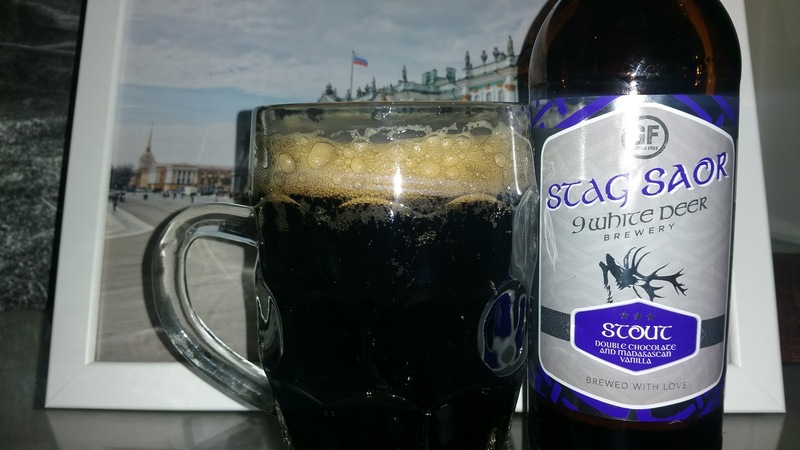 The result is something that Douglas Adams might describe as something that tastes almost, but not quite, entirely unlike beer. For a number of years, Estrella Daura has been one of the few gluten free beers available which actually tastes like beer. It uses normal barley like any beer but they used some magic to remove the gluten. 9 White Deer have done the same thing. They have used a bit of Cork magic, also known as Science to remove most of the gluten in their barley. The result is 5 barley based beers which tastes like any other beer. 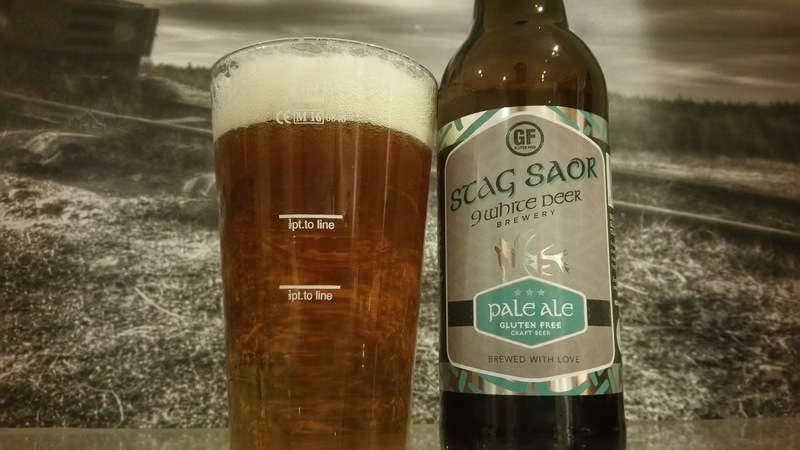 9 White Deer produced the first Gluten free beer in Ireland in 2015 when it was branded simply as Saor. 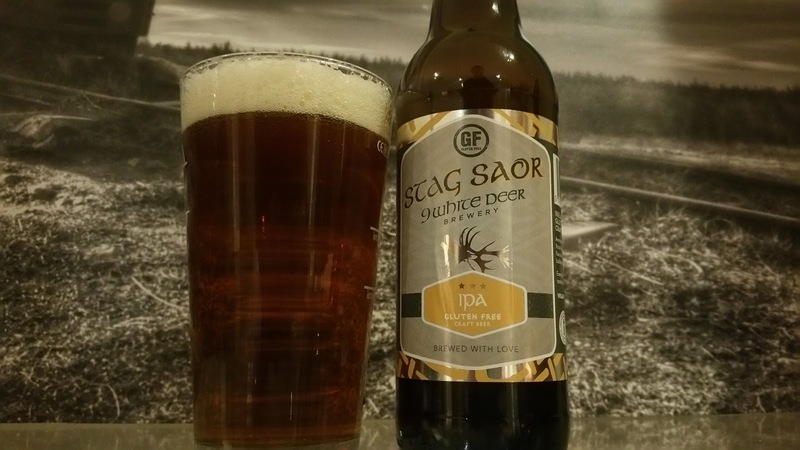 I believe it started as a pale ale and changed to a Kolsch style beer later where it won a bronze medal at the Irish Food Awards. From this beer, the whole new Stag Saor range of gluten free beers evolved. 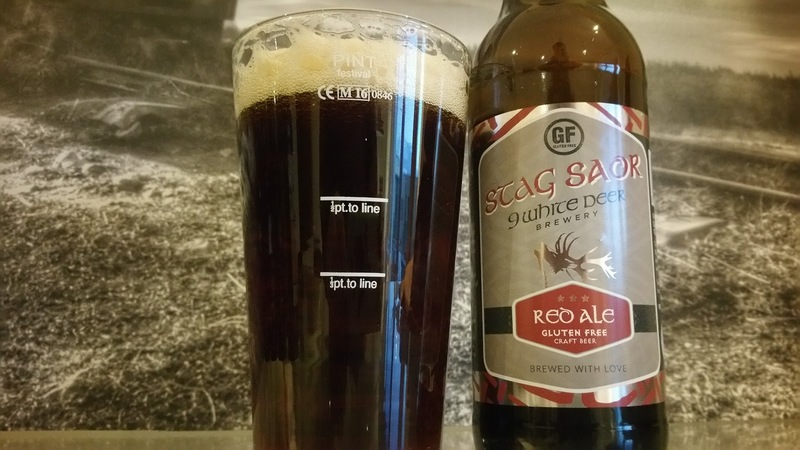 The Red Ale is your typical 4.2% Irish red. It's a little more bitter than some and quite dry which marks it as a little different. There's a nice but not overpowering roast and just enough sweetness to balance it out. A thin body makes it quite easy to drink. The Pale Ale is a typical 4.5% beer with a big citrus hit on the nose. It has a pronounced bitterness and some orange pith notes. Easy drinking again due to a thin body. The 5% IPA was similar to the pale ale but had more of a tropical fruits note with a little more finishing hops than the pale ale I reckon. Another soft body here but with this much flavour, it works nicely. The 4.2% Stout has a little extra in it. Lashings of cocao nibs and vanilla from Madagascar. It has your typical roast coffee and is bone dry. It's also rather bitter but it has a wonderful flavour. Again, the body is very soft. There's also the Kolsch which I neglected to take a picture of for some reason. Here, the soft body is perfect as it suits the style. All five beers seem to share the same soft body. It makes them all easy to drink which will suit some people nicely. I wonder does the removal of the gluten proteins affected the body of the beer? Perhaps someone with some science behind them can answer that one as I'm pretty interested in the process. The end result here is a range of beers that can be enjoyed by most people who are gluten intolerant as well as those that aren't. The real magic will be if the beer becomes available on tap in pubs. It would open up a whole new world to gluten intolerance sufferers. Well done to Gordon and Don for what is possibly the largest range of gluten free beers from a single brewery I have heard of in Europe, possibly even the world? I really like these beers. The stout in particular is excellent. Yeah, they were all good. Be interesting to have gluten free beer on cask at a beer festival. The stout especially would be good. In terms of range they're comfortably beaten by Manchester's First Chop and Stockport (by way of Belgium)'s Greens. Having tried quite a lot of GF beers, First Chop are definitely the best of them. And you do sometimes see them on draught around Manchester, but not sold as being GF - because you just can't guarantee that the lines are GF even if the beer is, unless you get really serious about preventing cross-contamination. Having said that, the threat from gluten is probably overplayed to some extent. Yes beer is made from barley which contains gluten - but that doesn't mean that beer contains gluten. Gluten is the enemy of brewers and they try hard to get rid of it, as it causes chill haze - and a number of brewers have found that just making normal beer produces a liquid that can be classified as GF. Obviously anything too malty won't be but quite a few breweries have tested their "standard" golden ales and lagers and found that they qualify as GF without further processing, even if not all of them go through the full process of certification. Cheddar have a good piece on their website about it. Oh that's fascinating about many regular beers ending up GF. I know distilling removes it completely. I hadn't actually heard of First Chop Brew. Thanks for that.